french architecture practice berranger & vincent (jérôme berranger, stéphanie vincent) has shared with us images of ‘house to catch the tree’, a small private house in nantes, france. situated on a narrow and steep site with a large chestnut tree to the back of the plot, the design opens up to the garden while maintaining, in contrast, a private street face. working with the local regulatory constraints of the area, the overall form of the residence allows for a double-height space with a slanted roofline that opens up to the east. wrapped in a skin constructed out of white metal cladding, the asymmetrical volume features an excised volume on the street level to accommodate a parking space for two cars. the front face is marked with a series of square-faced windows that continue to the roof surface to become skylights. in contrast, the garden-facing elevation is largely transparent by a number of rectangular windows and a protruding sitting room wrapped in a system of sliding glass doors. 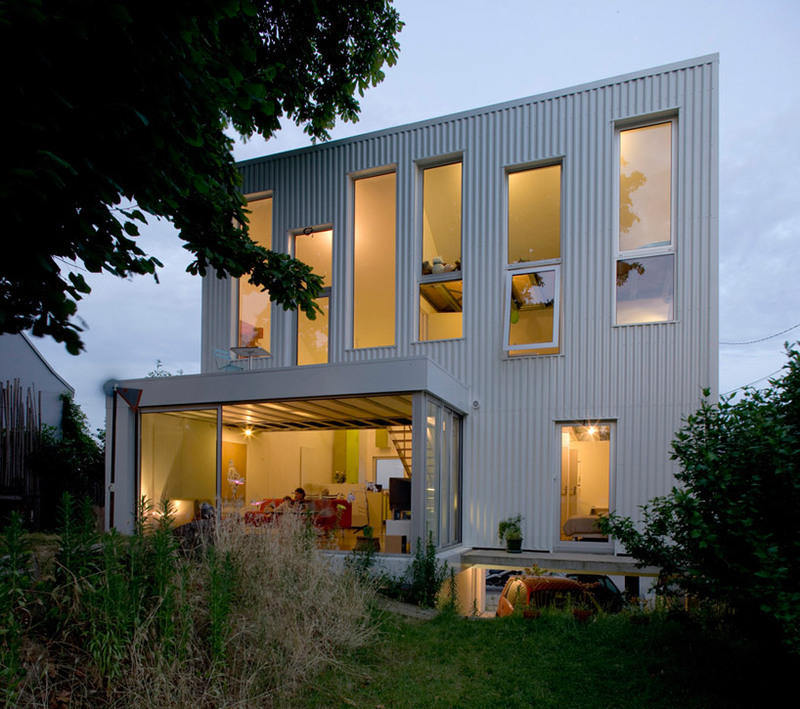 the result of this dichotomous treatment focuses the interior towards the back of the plot and away from the street. an old chestnut tree, which is listed in a classified wooden area, is utilized as a tool for light and thermal control over the seasons. a direct dialogue between the the architecture, the inhabitants, and the tree is established. why is there a television in that room?